"This massive, young stellar grouping, called R136, is only a few million years old and resides in the 30 Doradus Nebula, a turbulent star-birth region in the Large Magellanic Cloud, a satellite galaxy of the Milky Way. 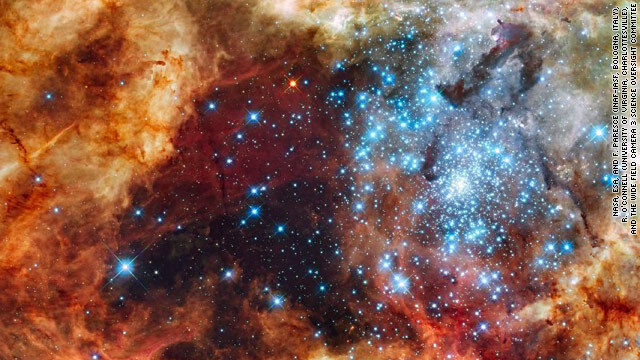 There is no known star-forming region in the Milky Way Galaxy as large or as prolific as 30 Doradus. Many of the diamond-like icy blue stars are among the most massive stars known. Several of them are 100 times more massive than our sun. These hefty stars are destined to pop off, like a string of firecrackers, as supernovas in a few million years. The image, taken in ultraviolet, visible and red light by Hubble's Wide Field Camera 3, spans about 100 light-years. The nebula is close enough to Earth that Hubble can resolve individual stars, giving astronomers important information about the stars' birth and evolution. These observations were taken Oct. 20-27, 2009. The blue color is light from the hottest, most massive stars; the green from the glow of oxygen; the red from fluorescing hydrogen."